Anglinarcher had the most liked content! 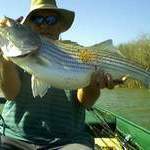 Fishing (all types), lure making, fly tying, archery, bowhunting. Unfortunately, you are about to start a very hard and very frustrating search. With few, if no exceptions, you can paint excellent chrome or metallic gold but the clear coat kills it. The paint by itself will not hold up well enough. Platting is expensive, but is the standard in the industry. Some of us are experimenting with foils, and on the right lure, with the right technique, the results are fantastic. Some of us are using glitter type paint if you will (http://www.airbrush.com/AA-Aluminum-Base-Coat-Fine-4oz/productinfo/162645/) and I find it gives pretty good results, but sure not a good chrome. Full disclosure, I am a hobbyist, not a "professional" so perhaps there is something that I missed, or something someone else had held back, but......... Technology is always improving so maybe this is the thread that will capture it. Has anyone tried to spaz stix brand paint? Yep, had wonderful results, right up till I cleared it. I tried D2T, Solerez, AlumiUV, and others. Good luck, I wish you the best. Depends on the paint I use, how I cure the paint, etc., etc. Lots of variables. But, for my method, which I don't profess is the best, I wait overnight. Small amounts are easier to get "correct" with a scale, and you can get one at Harbor Freight cheap. Larger amounts are more then close enough. Larry Dahlberg normally uses the pump that puts out a fluid oz with each pump. So, he uses the pump and makes batches 2 floz ea. First, mix the stuff in the containers very very well. It seperates some and you want a uniform mix, so shake up the containers first. Mixing by volume or weight will work just fine. It is more then close enough. Check out makelure.com and check out their videos. It is the best place (for videos) I know of for the basics of plastic or resin lure making in one place. Making lures is never cheep to get started and there is a learning process. But, once you get the basics mastered, it can keep the price down and the satisfaction level up. Not quite sure what you mean by thinner. All powder coat paints are, well, powder, and by their nature are the same "thickness". If it is going on two thick, you are either not getting your item hot enough, leaving it in the powder too long, or ...... I think I am a bit confused on this one. I have used enamel paint, in my youth, and in my old age, I strongly suggest that there are lots of much better options. It is just a real pain. AlumiUV for me. Seems to work the best for what I do. D2T is my back up. Actually, this is pretty normal. If you do it too early, or too late, then the motion is either not complete enough, or too much. Yes, lighted lures have been done, and due to the technology available at the time, the company is also done, cuput, dead. I think it used a red LED. I lived in Washington State and in the 90's, through maybe 2005, there was a lure that was available that used a sealed hearing aid battery and lighted the lure only came on when it was in the water (the water completed the connection). I think the lure was called the Lightning Lure, but I am not sure. I only had one and the water got into the battery compartment and destroyed it. It was a highly sought out lure for Steelhead fishing at night with the trollers. But, one in 4 did not even work out of the box and 3 of 4 would not work after one trip. That caused huge returns and massive outcry from the fishermen. I can see how a LED would work fine, but sealing the compartment for the batteries would be an issue. Still, my watch is waterproof. Energy recapture technology is not new, but the ability to use it is developing. Like Josh mentioned, examples are the lights that charge by shaking them, or the shoes that light when you move and walk in them. Typically that adds weight to the system, but if you can remove or dual use the weight for ballast, then it should work. Wire size for lake trout inline? .035 will hold any fish. A heavier wire will bend less when stressed. I tend to go with the .041 so the spinners bend less and therefore last longer. Tough question for sure. I am not sure that I have a "favorite", but several favorites. Top Water, Larry Dahlberg's Whopper Plopper. 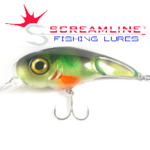 Top Water or slow sinking, a glide bait. Larry Dahlberg Mr. Wiggly soft plastic. Spinner, the Double Cow Girl. Swimbait style, a big bait like the Boot Tail lures. I don't get to fish for Muskie, or Tiger Muskie, often anymore, but the above were my my go to lures. I believe that improving any of them would be right on track.